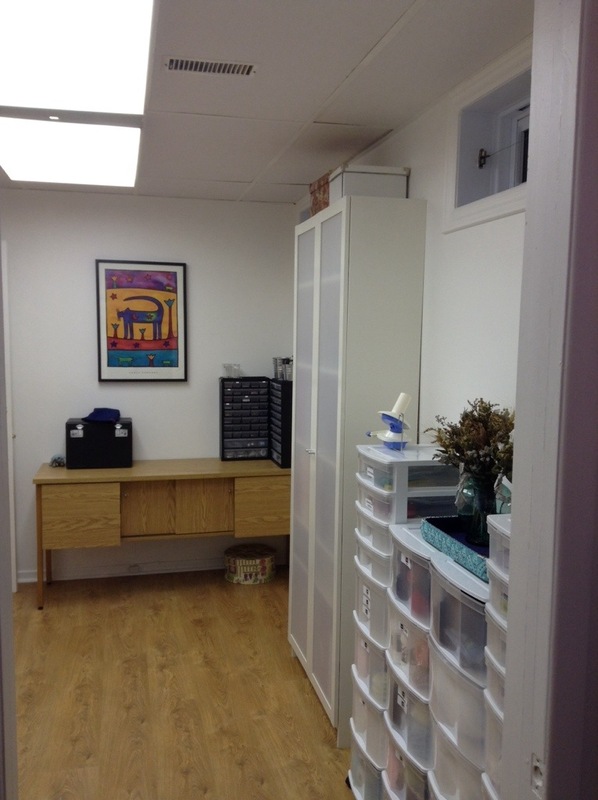 The Great Craft Room Renovation – Part IV – FINISHED! Coming to you live(ish) from the completed craft room. My Sparkly Sanctuary, My Homemade Haven, My Crafting Cave! At last posting, we had finished laying the laminate flooring. 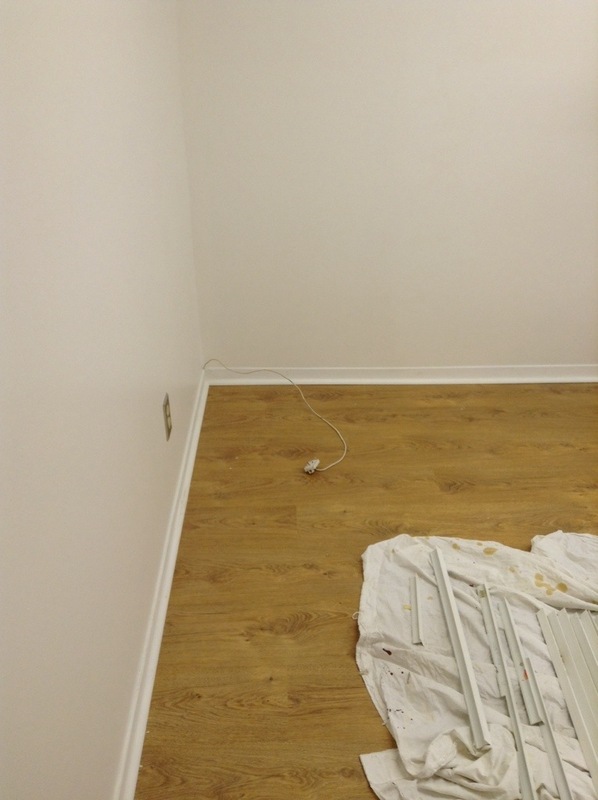 Since then we have painted and installed the baseboard and quarter-round, which really made a difference to the over all look of the room, it looks much more finished. 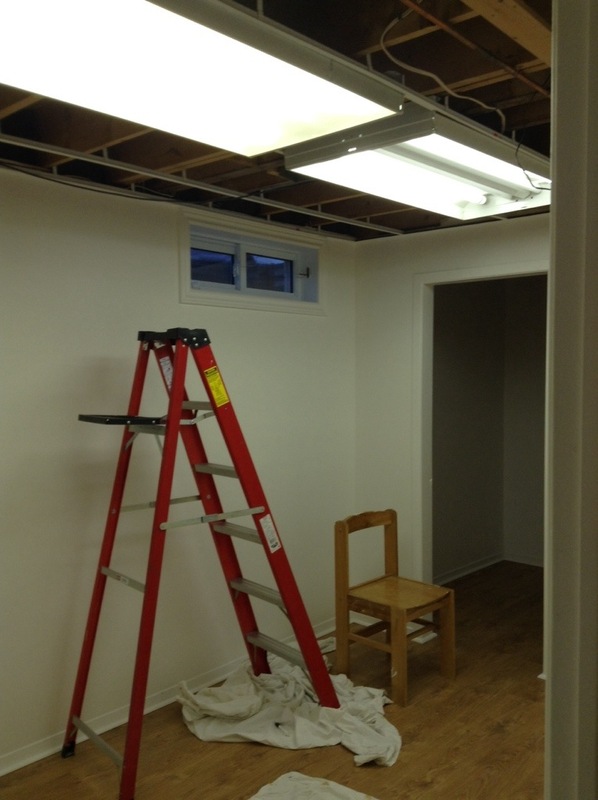 As we looked around the freshly painted and newly floored room, we realized just how incredibly crappy the ceiling tiles and fluorescent lights looked (one of which didn’t have a cover). So off to RONA we went and bought brand new ceiling tiles and new (and most importantly MATCHING) covers for the fluorescent lights). For this activity, we needed some safety gear since we would be working with fiberglass insulation. We couldn’t just demolish the old ceiling willy nilly either, as we had to make sure that we recorded all the measurements and the placement of the old tiles so that we knew where to put the new ones. So this meant, that as my DH removed each tile, I measured and charted each one. Now, it would never have occurred to me to hide things above the ceiling, but apparently, it did to the previous inhabitants of my home. Above the ceiling tiles, my DH discovered two VHS tapes of a certain nature (they were very clearly labelled)…in the immortal words of the excellent George Takei..”OH MYYYY”. We were expecting to find things like dead mice or bits of plastic. So that was a surprise. At any rate, once we stopped laughing ourselves silly, my DH carried on with cutting the new ceiling tiles to size, and I painted the plastic grid they sit in. 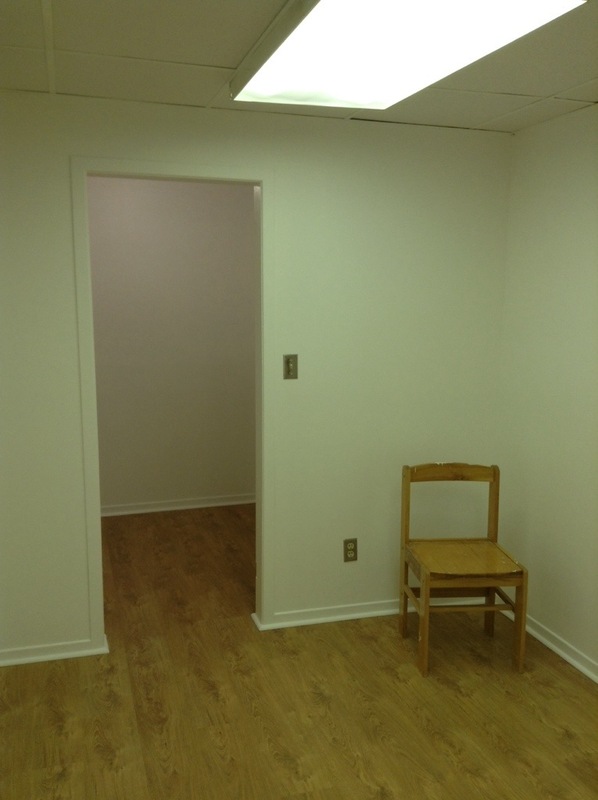 Having the fresh new ceiling tiles, is a huge improvement, it makes the room even fresher and brighter. So all that was left to do was clean up the floor where a few spots of paint had fallen and then move back in, but for the big shopping trip to IKEA! The first things to be moved in where my new plastic storage towers, with their new labels with everything from yarns by weight to scrapbook paper and paints. 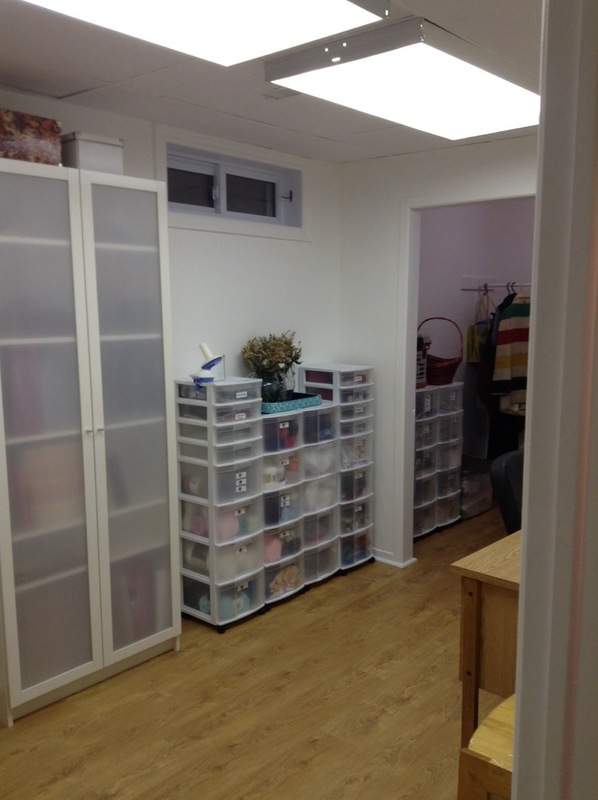 Two have been moved into the closet (the ones with paint, and scrapbook supplies), the four that contain, my sewing and yarn craft supplies are in the main room. We hit up the IKEA last week, and I purchased a Billy bookcase with doors (polypropylene and not glass), two plastic bag dispensers and a trash bin (but not to be used for plastic bags OR trash). 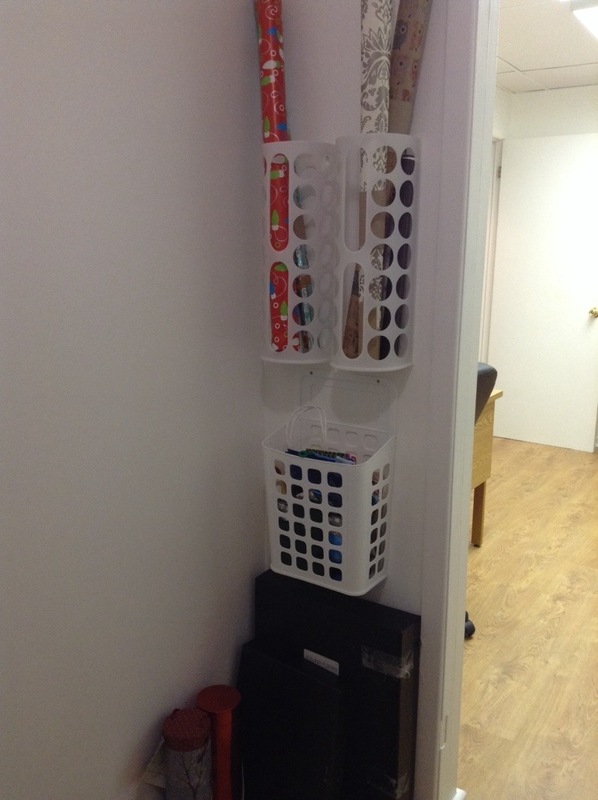 Thanks to an ingenious posting on Pinterest, they have been mounted to the inside of the closet for storing rolls of gift wrap and gift bags. Actually I will take credit for using the trash bin for gift bags, I just got the plastic bag dispenser idea from Pinterest. Hehehe. 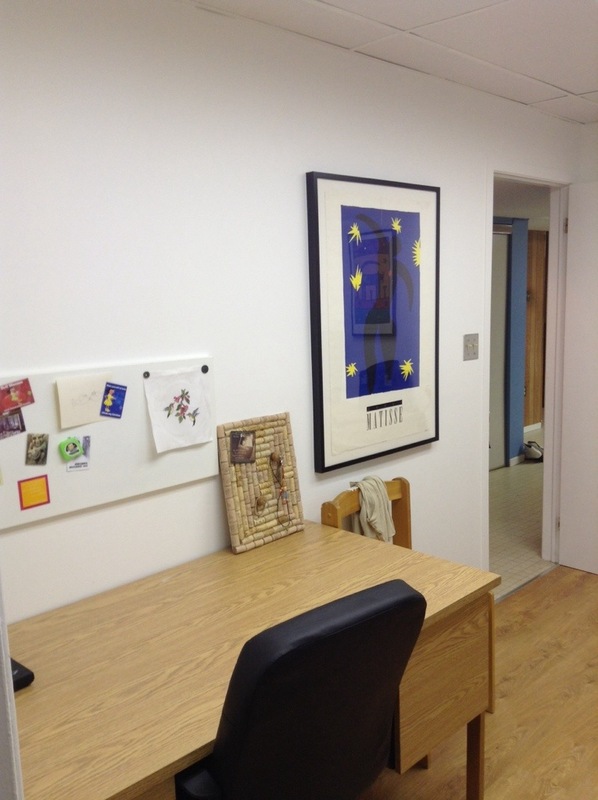 I also got a big frame for my Matisse poster that I have had since I was probably a pre-teen and though it is in really rough shape, now that it is framed it has a cool vintage look. Oh wait, that was more than 20 years ago…it IS vintage! I am not going to think about that. Assembling IKEA furniture is always fun, although occasionally frustrating. Assembling a large Billy bookcase in the middle of a not very large room, went fairly smoothly until it came time to slide in the back piece. That was tricky, although between my DH and I we managed to slide it in with the bookcase on its side instead of on its front. So the bookcase was assembled, wall mounted, and then the doors added, the desk and sideboard were moved back in, the posters were famed and hung, the clothes rail installed in the closet and my gift wrap holders were stuck in their places..
Once all this was done I spent a lot of the weekend, finding the right homes for all my stuff and making sure it was all organized. Now all I need is a week off work to spend playing in my new favorite room! I came back down today to write this blog post and unfortunately my gift bag holder had fallen off the wall, the sticky thing didn’t stick enough. So I fastened it and the roll holders more securely with screws. Now it’s perfect! I really could not have done this without my amazing husband, he did all of the difficult construction work, he’s the best. So that is it folks. I hope you have enjoyed the ride as much as I have and now I have to go make something. Sorry the pictures are out of order, the set up is different on the iPad.